Archaeologists uncover information about homeless people and immigrants based on their material culture. Their discoveries contradict popular beliefs about these groups of people. Many might not consider that homeless people have a desire to learn and think critically, but that is exactly what archaeologists discovered. The short documentary, Inocente, follows a 15-year-old homeless girl in San Diego, California. The girl, Inocente, attends school and dedicates herself to her art. Her ambition, dedication, and independence appear throughout the film, disproving stereotypes about homeless children. Like archaeology, film shows the reality of homelessness and immigration. People suffer from stereotypes everyday. No matter what race, gender, or ethnicity a person may be, society tends to develop stereotypes against different groups of people. Homeless people, unfortunately, have suffered a great deal from stereotypes. I know that when I think of a homeless person, my image is someone in old, dirty, beat-up clothing who is sitting on the sidewalk of the city streets next to a can and a cardboard poster asking for money. After the screening of this movie, I now realize that not everyone who is homeless lives like that. Many people who are homeless do not have a place to call their home for an extended period of time. Inocente, a 15-year-old girl from San Diego, is an example of someone who is homeless, yet does not fit that description stated previously. The story of this 15-year-old girl’s life is one that is truly inspiring and powerful. The MTV documentary, Inocente, goes through the extremely difficult life that this young girl has already had to encounter, yet somehow has been able to find the positive through it all. At only the age of 15, Inocente is someone that many people throughout this world should look up to as an individual. Despite her surroundings and lack of childhood, she never loses sight of her dream to become an artist and never loses hope in herself. Inocente is an undocumented immigrant from a broken household who has been without a permanent home for the past nine years. She is a victim of domestic violence who, now because of that, is without a father figure in her life and is left with a mother who she is not emotionally disconnected from. Prior to viewing the film, I thought that her paintings and artwork were going to be very dark and gloomy, as anyone would expect from someone who has gone through pain of such great magnitude. However, after the screening I was amazed at how Inocente uses a multitude of vibrant colors in her artwork which reflects nothing of what her past would look like on a canvas. 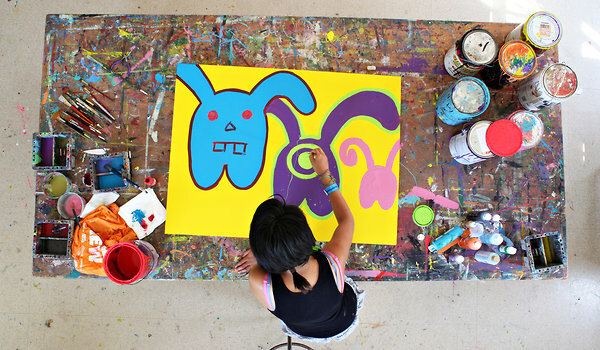 Her mind pictures mini cyclops creatures and fantasy worlds which are created out of bright colors. Going back to the topic of stereotypes, society tends to discriminate against the homeless because they add little value to the world so to speak. Not many people would think and believe that someone who is homeless possesses unique skills. Inocente is an individual who has an enriching personality, sweet heart, and the vision and ability to create vibrant and colorful works of art. As a result of this documentary being created, she had her own art show in NYC in which every single piece of art displayed was sold, except one that she had kept for herself. This just goes to show that one never knows what skills a certain individual may possess, so to stereotype against them is unfair. One of the rooms of Inocente’s first ever art show in which all but one works of art sold. The one that did not sell she kept for herself. The story of Inocente is one that society should look at and rethink how they form stereotype and opinions against different groups of people simply because of a title they may have adopted over the years. It may not be someones fault why they are where they are in present time, and it is no ones business to judge against anyone. The documentary does an incredible job portraying this. Inocente will never be able to get rid of the memories of what her life was like in the past, yet her future is brighter then ever. She is now living on her own at age 19 in an apartment in NYC and continues to create colorful and vibrant artwork. Despite all of the obstacles that Inocente has encountered in her life, she has never let them slow her down from becoming the person she is today and will be in the future. Living a nomadic lifestyle, means things get left behind when one cannot carry things from place to place. In Inocente’s case, she leaves her art as her legacy. Looking at homelessness from an archaeological view and analyzing the things that these people leave behind, or their material culture, can show a lot about the way that homeless people live and survive without permeant homes. Inocente and her family are forced to move from place to place and she recalls that she does not remember living in a place longer than three months at a time. Her, her mother, and her two brothers are forced to live, eat, and sleep together in a small room, giving them not a lot of opportunity to bring tons of things with them as they move. It is also important to limit the amount due to the fact that the small family has to carry everything they own when they move as they cannot afford to hire movers or anything similar. This limitation causes them to own things that can be carried on their bodies and things that can fit in carry-able bags. In class, we talked about what we might bring with us if there was a fire in our building because this would show the things that were most important to us and our survival. I think looking from this perspective towards Inocente can show the things that are most important to her. The majority of the video speaks of her art and her ability to paint her dreams in her pieces, using bright colors. She even paints her face in a new and exciting way each day to express her feelings in ways she cannot do as a shy girl in her class. Just speculating, I think due to the video, if her room caught on fire, if she could save a few things, I think they would be her art and makeup supplies. Not a lot is said about her immigrant status, except for the brief mention that she is undocumented and that her father was deported. This aspect is crucial in her life because without her father, who used to beat her and her mother (probably a good thing he was deported), her family has almost no means to provide for themselves. The mother is undocumented as well, which means that she cannot get a significant enough job to pay for a steady home for her three children. Through archaeology, I’m guessing, one could look at the ways in which their family is connected to their Mexican past by seeing if one of the things that they bring with them relates to this culture. This also led me to think of art as archaeology. I’m wondering if there are certain ways that one can study a person by the things they paint and the methods they use. I’m sure that would be an interesting way to look at Inocente’s life from her paintings to examine her feelings and possibly the events in her life. Movie: Inocente: Homeless. Creative. Unstoppable. Archaeology is a tool the world can and does use to break down stereotyping. The documentary on Inocente shows how the assumptions on homeless people are tainted with inaccuracies. In the first 30 seconds of the film we hear Inocente say that she is a girl who likes to jump in puddles. Inocente is a child. There is a large population of homeless children yet the average person thinking about a homeless person is not a child. 1 in 45 children in the united states will experience a homeless experience. That means over 1.6 million children. Another important stereo type that is not seen in this situation is that being homeless doesn’t necessarily mean not waking up with a roof over your head. Inocente mentions the multiple shelters they’ve stayed at and the small rooms they’ve rented. The main issue is that after staying in a room for too long they won’t be able to pay and have to move because of their undocumented status. The place Inocente’s family stayed in during the film was in a small garage like building. Inocente did moved out at one point to get away from her family to work on independency and focus on her art. Although there are homeless artist that create dismal pieces inocente’s art is the complete opposite. 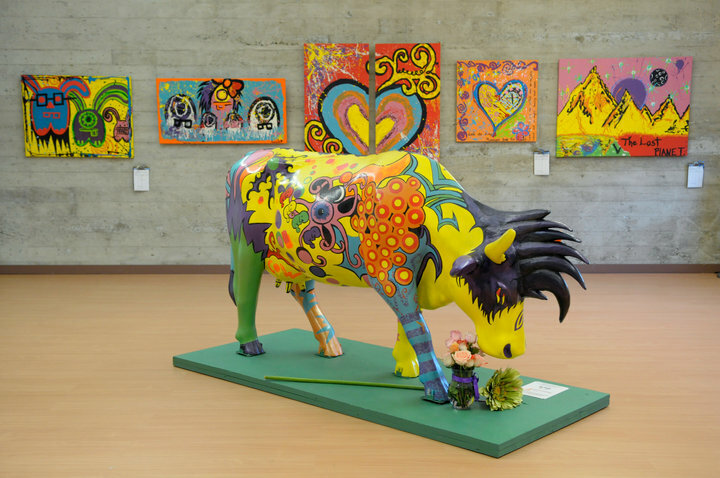 Inocente’s art is modern and surreal, with bright colors and messages of love. The documentary shows how hard Inocente’s mother works for to supply for her family. This contradicts the stereotype of lazy homeless people. Inocente’s mother dreams of a house where her family can live and call theirs. Inocente brings a new perspective to those who are homeless. Inocente. Dir. Sean Fine and Andrea Nix. Salty Features, 2012. DVD. This article is about how Archaeologist are directly learning how to help homelessness. Inocente is a 15 year old undocumented immigrant who has lived homeless for the past 9 years. While confined to the limitations of her situation, Inocente uses artistic expression to convey her emotions, temporarily escaping the adversity that surrounds her. 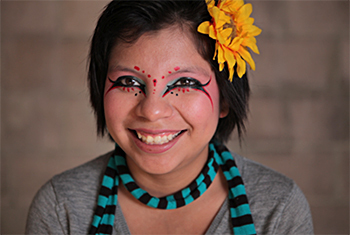 The documentary follows Inocente’s daily life as she interacts with her family and produces original artwork for a community show. Inocente’s life sheds new light onto the bleak stereotypes of homelessness and undocumented immigrants. The colorful and cartoon-like artwork Inocente created for her art show. Inocente immerses her viewers into a major problem for undocumented immigrant families, domestic abuse. When asked about the major dangers undocumented immigrant families face, several thoughts emerge: being smuggled across the border; surviving the dangers deserts of the Southwest; being discovered and deported; and financial issues. These prevalent stereotypes dominate the discussion about undocumented immigrants, closing the door on the many other problems they face. Inocente shares her grim story of domestic abuse that ultimately culminated with the deportation of her father and emotional distance from her mother. This look into Inocente’s life shows that even though they are a family of undocumented immigrants, they are still a regular family with problems reflected in other American households. Thinking of undocumented immigrants as only being underpaid workers constantly avoiding deportation is a narrow-minded stereotype and Inocente’s story of her family struggles shows that undocumented immigrants are regular people too. Inocente’s colorful expression in her artwork and passion for becoming an artist breaks from traditional stereotype of a homeless person. When thinking of a homeless person, the first images that come to mind are: dirty old clothing, expressionless faces, and begging for money on the sidewalk. This stereotype of the homeless was proven wrong within the first 30 seconds of this documentary seeing Inocente apply her daily make-up and expressing her inner creativity with unique designs and bright colors. 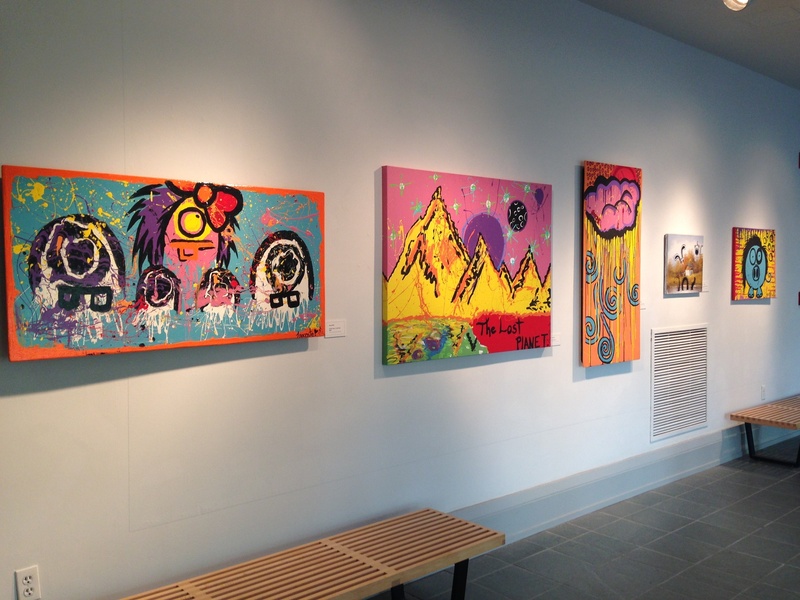 Instead of the dark and gloomy ideas that are commonly associated with homelessness, Inocente paints bright and cartoon-like characters on giant canvases, creating her own happy world. She perseveres to better herself in other facets of her life by attending school and working to legally emancipate herself from her mother. 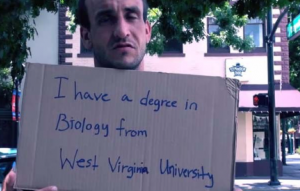 These examples of Inocente’s drive for a better life completely shatter my previous ill-informed stereotype, showing me the realities that life as a homeless person go beyond people just sitting on sidewalks with cardboard signs begging for money. Picture showing the colorful and creative designs Inocente uses in her make-up. Inocente’s story serves as a great example to the ignorance of stereotypes and the value of peeking into a 15 year old’s life to overcome those misconceptions. Although being homeless and an undocumented immigrant are forever apart of Inocente’s life, she does not let those aspects detract from her dreams of becoming an artist and being happy. Often people misinterpret and even forget about the homeless population of America. Throughout class we have talked about how archaeology and anthropology challenge stereotypical beliefs about homeless people. In all, archaeology can explain how homeless people are more significant and normal than people think. 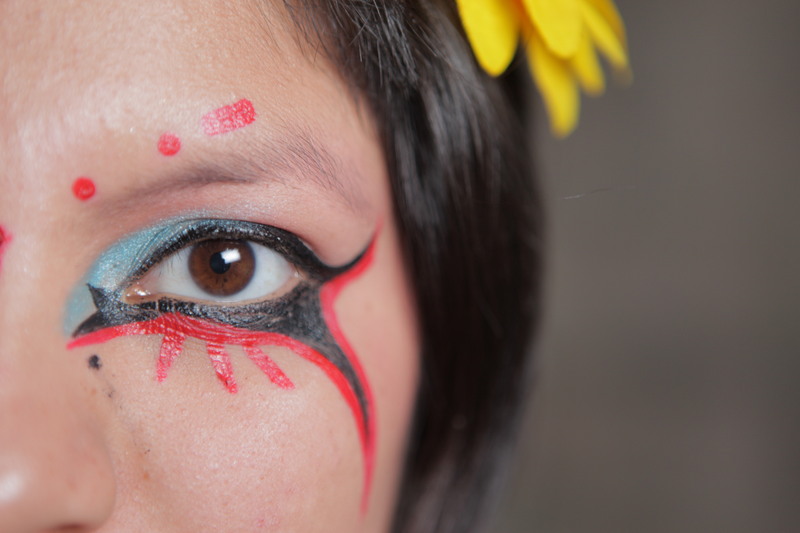 In MTV’s documentary, “Inocente”, the main character does not give up to the helplessness of her surroundings and is persistent to become a world-class artist. When she was a child her Dad beat her and one day he beat her so hard her mother called the cops. The next day he was deported to Mexico. According to Inocente, this is when her homeless journey started. It is not her fault that she is homeless and like many homeless people, she refuses to let society define her. In this case, archaeology can be used to examine Inocente’s experiences in order to realize how much she needs to move around and how she’s able to survive. The documentary reveals that Inocente’s dream to become an influential painter motivates her to live and migrate from homeless shelter to homeless. 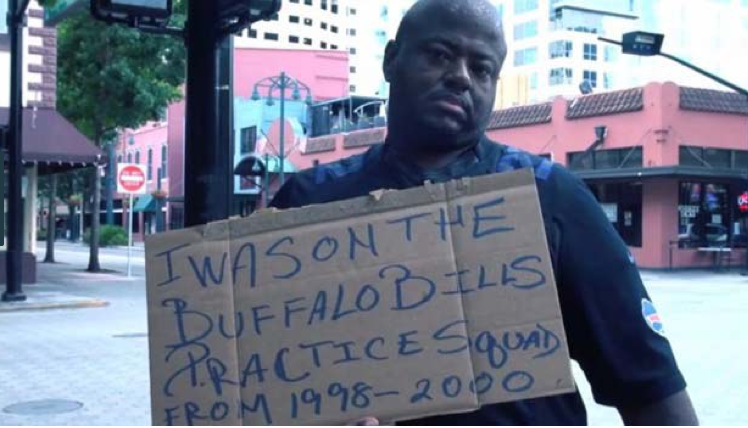 The one thing that puzzles me is why do many Americans assume that homeless people don’t have any talent or intuition. In the documentary this wasn’t directly mentioned but Inocente’s story made me wonder why do many people believe that homeless people are worthless and loony. These certain stereotypes help destroy the identities of homeless people like Inocente. An organization called Rethink Homelessness strives to challenge these negative stereotypes about homeless people just like the MTV documentary does. The campaign is centered on a documentary, which is about homeless people living in Florida. The campaign’s film emphasizes how homeless people can be very talented and unique. The film doesn’t tell the story of how these homeless people are homeless but instead shows the homeless people holding cardboard signs with facts written about themselves. The campaign uses these facts to destroy stereotypes that note homeless people as forlorn and proves that these people are talented and apt. Organizations like Rethink Homelessness and MTV are changing common misconceptions about homeless people and are further humanizing their identety in society (they are normal people!). So next time when you see the local hobo walking from street to street looking for shelter, don’t just assume that he or she is hopeless and nutty. Problems in society arise, in part, because of a clash in viewpoints. People are all raised under their own unique conditions, causing them to see the world in certain ways. If a person has been raised in a certain culture they will adopt the opinions of that culture. Conflict arises when people with differing opinions clash. No one person thinks exactly like anyone else so as long as people are only able to understand their own ideas conflict will continue to occur. Problems in trying to help other people, such as in a psychiatrist patient relationship, crop up when differing perspectives don’t reconcile with each other. If a psychiatrist uses only an etic approach with his or her patients he or she will hold preconceived notions that will affect how he or she interacts with his or her patients and his or her ability to help them. The psychiatrist will make inferences that fit the patients into a ready-made mold and diagnose them according to this mold as well. A fully etic approach creates stereotypes leading to conflicts between cultures, races, educational levels, etc. This approach leads to other misconceptions as well, such as the idea that a homeless man would need a one hundred dollar pair of shoes and the idea that he is ungrateful for not wearing those shoes. An ideal approach to prevent disputes between people is the emic approach that allows you to understand others thought processes. Adopting others’ emic ideas and gaining and understanding of their thought processes is important. Understanding how and why people do the things they do lessens the amount of complications. It is very difficult adopt this approach entirely, however; in some cases, it is impossible. 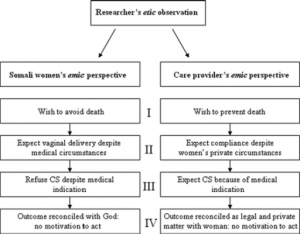 It is, therefore, more beneficial to take an etic-emic approach. This is a blend between the two perspectives that allows a person to have a rounder, fuller understanding of both sides of a story. One step to fixing world problems is by trying to look through other people’s eyes and understand how they see the world. Conflict will always occur because it is impossible to get everyone to agree on everything. Problems would be better resolved, however, if people tried harder to understand each other’s perspectives. 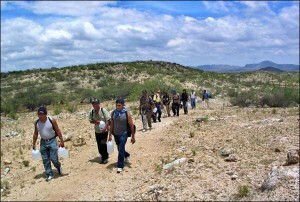 A group of immigrants attempting the trek across the US-Mexican border. As you can see, they are carrying plastic jugs of water to stay hydrated, although the water likely is not enough. died in that harsh environment just trying to make it across (lots due to lack of water), and many made it here just to get deported back to their home countries. That might change soon, thanks to some recent activity at the White House. 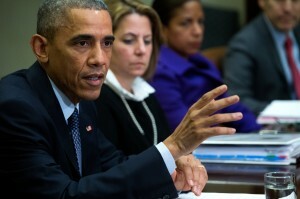 President Obama discussing the details of his executive order, prior to its release on Thursday. United States for at least five years will be able to apply for a government program that protects them from being deported and allows them to work legally in the US without facing potential criminal prosecution. In addition, more migrants will be protected from deportation through reforms to the United States’ immigration enforcement system. What does this mean for immigration into the United States, and how do we apply archaeology to this question? Well, archaeological researchers have found that immigrants are perfectly willing to undergo the trek through the desert rather than immigrate through parts of the border a with less dangerous climate but more heavily guarded by the United States border patrol. Moreover, these immigrants often depart without the supplies they need to keep a lower profile. Examples of this are the imitation Nike sneakers worn instead of hiking boots (which are not as good at protecting the feet but make them look more like Americans) and the black plastic water jugs used by some (which heat up their water but are supposedly “less visible”). An executive order making it easier for immigrants who make it across the border to stay in the country will undoubtedly make immigration to the United States more enticing for those living in Latin American nations. In addition, since this order was not accompanied by a loosening of security on the parts of the border that do not lie along the Arizona desert, the increased number of immigrants trying to cross over will undoubtedly funnel through the Arizona/Mexico border and many will die. So, Obama’s new policy will lead to not only more immigrants (who might not have before wanted to cross over into the US due to fear of deportation but now feel that they will be safe) but to more deaths in the desert. A potential solution to this problem would be to set up water stations on the border. Millions of foreigners attempt to start a new life in the United States by illegally crossing the U.S.-Mexico border. 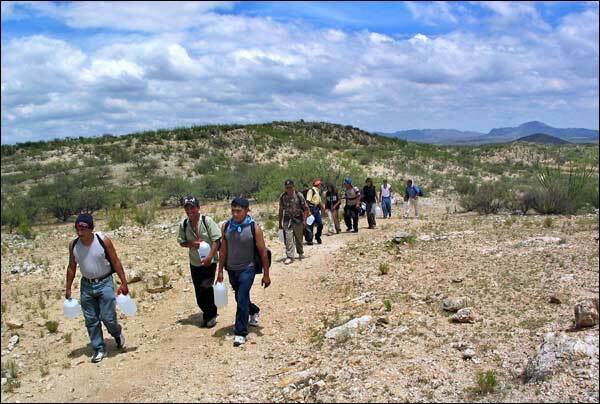 Once across the border, the undocumented immigrants begin their hazardous trek by foot through the arid deserts where extreme temperatures and animals threaten life. Given all the dangers, it is not surprising that the U.S. Border patrol annually finds, on average, 417 undocumented immigrant bodies in the Southwest in places like mass graves. 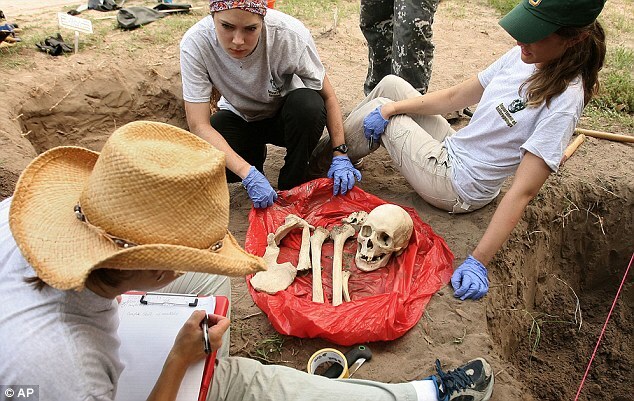 Lori Baker, Ph.D. leads a team of thirty archaeologists and forensic students from Baylor University excavating a mass grave of undocumented immigrants in Falfurrias, Texas, eighty miles from the U.S.-Mexican border. The main goals of Baker’s excavation is to identify the deceased and thereby restore their dignity even in death. 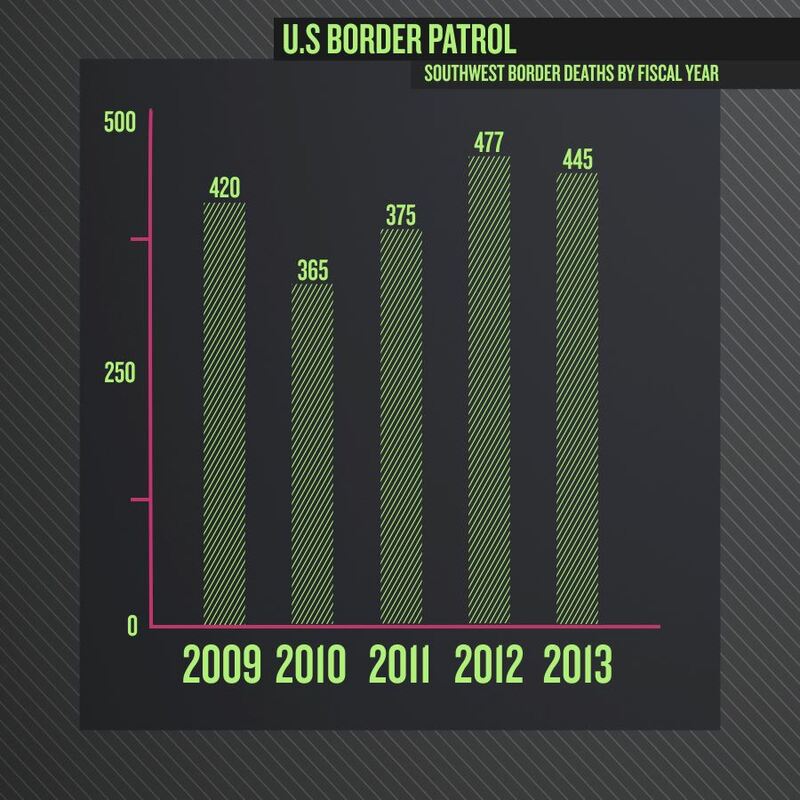 Illustration showing the number of undocumented immigrant bodies found in the Southwestern desert each year. 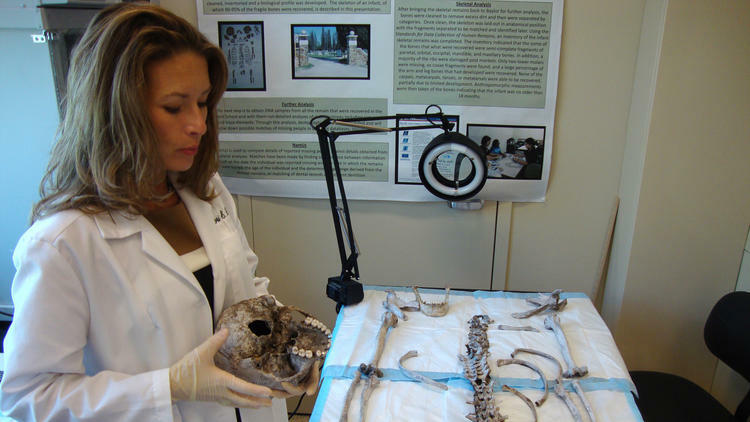 The archaeological strategies in this research are challenging, and Baker’s team must be careful when searching for the bodies because a majority of the remains have been skeletonized. Shovels cannot be used because the remains have been buried so carelessly, forcing the researchers to dig by hand, a daunting task in the 100+ degree weather. Once bodies are found and carefully removed, the team pushes a metal wire down into the soil to test its resistance. The resistance will show if there are more bodies buried underneath. Dr. Lori Baker and her team cataloging a set of bones uncovered at the mass grave site in Falfurrias, Texas. Baker’s team has unearthed bodies in multiple receptacles, amplifying the brutal disregard for these immigrants’ lives. Baker referenced that, “They’ve been in trash bags; They’ve been in milk crates; We found one in a top handled green bag from a funeral home that had ‘dignity’ on the side and there’s no dignity in someone being buried in trash bags.” The recovered bodies are thought to be Central American immigrants; all hoping to find better life in the United States. The final step for Baker and her team is to transport the remains back to the Baylor Lab for DNA testing. Researchers hope to identify the remains so that they can notify the family and bring some closure to the deceased’s whereabouts. Dr. Lori Baker in her Baylor University laboratory inventorying remains found in the Texas desert. The excavation of mass graves illuminates the mistreatment of undocumented immigrant remains and Baker builds off her teams’ findings to suggest a solution. Eliminating the initial need for the dangerous journey is the root of the solution. The current immigration laws concerning United States citizenship are not in the best interest of immigrants. 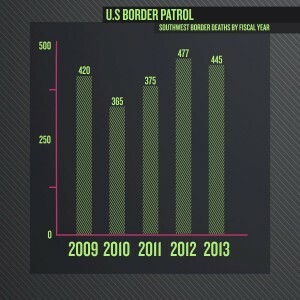 Baker describes the massive spike of finding children remains after talk of the DREAM Act. The DREAM Act, which permits immigrant students who grew up in the United States to become citizens, encourages undocumented immigrants to bring their children through the desert. Unfortunately, these children cannot properly regulate the intense heat, leading to their premature death. A change in the immigration reform is necessary to solve this problem so immigrants do not have to endanger their lives for the American dream and anthropologists like Lori Baker will no longer have to excavate these mass graves and struggle to bring a measure of human decency to the immigrants’ final remains.